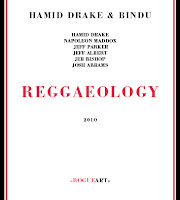 I have been dancing up and down all day on this new Hamid Drake album, which is a jazzy celebration of the rhythmic variations and possibilities of reggae music. Long after the album has ended, spontaneously the old Marley tunes of "Lively Up Yourself" or "Burnin' and Lootin'", came back to live in my head, although the album has no direct reference to the Jamaican or his music. Drake turns reggae into his own kind of music, adding hip hop vocals by Napoleon Maddox on vocals and beatbox, with Jeff Parker on guitar, Jeff Albert and Jeb Bishop on trombone, and with Josh Abrams on bass and guimbri. He also adds spoken word and singing, continuing the spiritual Hindu elements and the adoration of Kali, that he already worked with on "Blissful", his previous album. The big difference here is the double trombone and bass line-up, with gives the band a warm powerful volume over Drake's brilliant polyrhythmics. Parker's guitar adds the right touches, predominantly rhythm guitar, with the occasional jazzy, rock-ish or reggae-ish solo escapade. The other big difference is that the vocals are mostly sung or rapped, which fits better with reggae than with jazz (at least to me), but luckily the space they occupy is not very dominant. Despite the length of the compositions, it is very much a tight affair, with not many expansive time for soloing: the whole thing remains a group thing, but it's only when the two trombones interweave their solos as on "Togetherness", over the exciting rhythms, that the fun is total. He also brings a new rendition of the hauntingly beautiful "Meeting and Parting", that was the highlight of his first Bindu album. Sure, this is not jazz. But its exhilirating rhythms, the powerful rhythm and horn section, and Drake's unparalleled drumming make this album a real joy. Not everything works, but the drummer has created something quite unique and special. Listen to extracts here from the RogueArt website.